The end of June is here. With that marks the end of soccer season. It has been a great season. 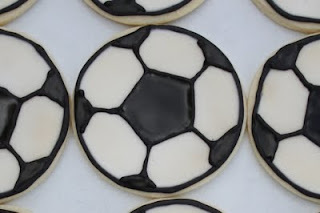 I have 4 little soccer monsters, 3 of them played soccer this year. They amaze me with their talents, passion and different personalities. What a lucky Mom I am. This year I was lucky enough to coach the 8 year old boys along with another Mom. They were a great bunch of boys and made coaching a joy. 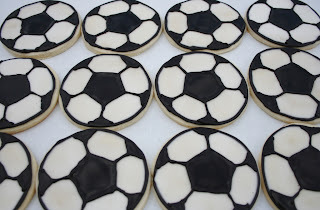 In honour of a great season I made 4 dozen soccer cookies. One dozen went to my daughter's coach. He is a great guy with a great family. 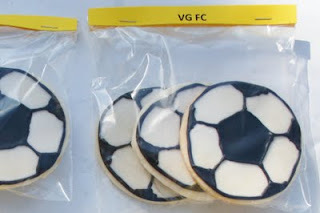 The others were given to the boys on my team (with a few, ahem, held back for my family). I love making sugar cookies with Royal Icing. Ever since I figured out my recipes, I cannot get enough. It is probably a good thing that it takes me so long to decorate, because if it didn't I would be making these all the time! This picture shows how I packaged them for my boys team. Of course, I do realize that cookies are just a little treat. The big deal was the trophies earned and the friendships made. Check out this post to find my recipe.